Depending upon the number of images or videos you have, you might need to rely upon external hard drives for much of your daily photography work. The biggest issue, though, is that this can result in a significant slowdown compared to editing photos via an internal drive, especially SSD or flash storage. What are your options? One possibility is to use an external hard drive enclosure capable of RAID configurations, letting you speed up your storage or mirror the information on your drives automatically for peace of mind. The TerraMaster D2-310 Hard Drive Enclosure is one such entry-level RAID enclosure, retailing for $160 (not including the two hard drives it can accept). In the review below, we will dive into the D2-310 and explain whether or not it is a good piece of equipment for people seeking a more advanced external hard drive solution. You may have heard the acronym “DAS” thrown out before to describe storage, along with its counterpart, “NAS.” The simple difference is that DAS (Direct-Attached Storage) drives are storage options that attach to your computer directly, including everything from an SD card to a thumb drive, as well as external hard drive enclosures like the D2-310. NAS (Network-Attached Storage), on the other hand, is connected to a network and hence must be accessed from it. While DAS storage can only be connected to a single machine, NAS can be shared between multiple computers, as explained in our Storage Considerations for Photography article. Despite all the advantages of NAS, DAS arrays are typically cheaper and they are easier to set up, since they act just like external hard drives. In the case of the D2-310, it is a DAS array that must be directly connected to a computer, which can be a downside for photographers sharing workspace with other team members or working remotely. However, it does have one distinct advantage over typical, basic NAS arrays that work over regular 1 Gbit networks: its potential performance. With the USB 3.1 interface, the D2-310 is capable of very fast transfer rates over 400 MB/s, which is not possible to achieve with NAS devices over a 1 Gbit network. The D2-310 itself does not come with any hard drives, which is normal for this type of product. Instead, it is set up in a way which allows you to add up to two SATA or SSD hard drives of your own – the same type that normally goes into a computer. The benefit of this setup is that it allows you to use any low-cost, fast storage you can find, including existing hard drives for a PC build that you might have laying around in your house. On top of that, the D2-310 also allows you to configure the two drives in a number of different configurations, including RAID 0 and RAID 1. RAID 0: Made for speed. If you configure the D2-310 in RAID 0, you’re giving a significant speed boost to your external storage. Essentially, the storage array is capable of reading from and writing to two drives at the same time, significantly increasing performance. The downside is that if one hard drive fails, you lose all of your data in the whole array. RAID 1: Drives are mirrored for safety. In this configuration, every file copied onto the storage gets copied to both drives simultaneously. In fact, it functionally acts like a single hard drive, except that all your data is stored on it twice (it even appears as a single drive within the operating system). If one of your two drives fails, the data remains intact – put in a replacement, and the data will replicate automatically. The downsides? Less speed, and half the storage space (because each drive mirrors the other). Because the D2-310 only allows for two hard drives, these are the only two RAID configurations you can set up. However, larger storage enclosures with four and more drive enclosures allow for other types of RAID, such as RAID 5, RAID 6 and RAID 10. The D2-310 is built very solidly, with an all-aluminum exterior. The included toolkit has everything you need in order to set up the hard drives yourself, including two screwdrivers and a needle tool to access the D2-310’s “reset” button. Heat dissipation on the D2-310 is impressive, and I have yet to experience any issues with the aluminum feeling hot to the touch, or even particularly warm. On balance, its construction is good. However, there are a couple minor issues worth noting. First, the aluminum does not do a great job dampening the sound of spinning drives, resulting in a system that isn’t especially quiet. It isn’t loud, either, but you’ll notice a clear difference between this and something like a silent SSD (if you use the D2-310 with SSD drives, of course, the noise decreases, although you still hear the fan). The other issue is that the dial for alternating between the various configuration options (RAID 0 and 1, as well as a couple other options) feels like it was added as an afterthought, despite its importance. Although it is perfectly functional, mine looks like it was marked with hand-drawn red pen to indicate which direction it’s actually pointing. Again, it still works fine, but it’s a bit of an oddity. In addition to RAID 0 and RAID 1, the D2-310 also allows two other drive configurations: JBOD and Single. JBOD essentially combines the drives into a larger one; in this configuration, if you have two drives of different sizes, say 1 TB and 2 TB, JBOD will combine the two into a single 3 TB volume (with RAID 0, the drives would need to be the same capacity). This configuration does not have the speed benefit of RAID 0, although it might make it easier to recover data from one drive if the other fails. Single keeps the drives completely separate. It is the only storage configuration which results in both drives appearing independently on your computer, as if they aren’t part of the same enclosure at all. In my opinion, this negates one of the main benefits of the D2-310 in the first place, which is to allow RAID 0 and RAID 1 configurations. However, some people may find “Single” useful for swapping drives individually, or keeping totally independent information on both drives at the same time. One major reason to purchase the D2-310 is for the potential speed benefit it has to offer. But how much of a boost will you get compared to normal external (and internal) drives for things like reading, writing, and transferring files? 1A slight difference between the two drives in Single mode is to be expected. Even though they are the same model, speed will never be completely consistent. Not bad! In RAID 0, the D2-310 has a significantly faster write speed than even my MacBook Pro’s internal storage does, according to Blackmagic (though, granted, my computer is starting to slow down with age). TerraMaster claims that the D2-310’s maximum speed can reach up to 410 MB/s (read) or 400 MB/s (write) with certain hard drives, although it could be quite expensive to buy drives that can reach that limit. RAID 1, JBOD, and Single modes only show minor differences in performance. So, how does the D2-310 with the HGST drives compare to cheaper options? I tested a sample external hard drive to compare (the 5 TB WD Elements Desktop hard drive, retailing for $154) against the D2-310 in RAID 1 configuration by transferring a 1 GB file to each. The resulting times: 15 seconds for the D2-310, and 41 seconds for the WD Elements hard drive. This is the benefit of using fast storage, as well as a speedy USB-C connection! The D2-310, as a whole, is quite a good piece of equipment. In fact, the main issue is that it only allows for two external hard drives, which is something you would know from the start. As it is, there is no way to gain the benefits of both RAID 1 and RAID 0 simultaneously, meaning that you will need to make a decision between the two, taking things like data loss and speed into consideration. The slight issues with the build quality of the D2-310 are just minor concerns, and the attractive price makes this a good value if you want to test the waters of advanced DAS storage. It certainly is faster and more feature-rich than a normal external hard drive, making it a viable solution for advanced tasks like video editing or intensive Photoshop work. I enjoyed your review of this DAS enclosure. 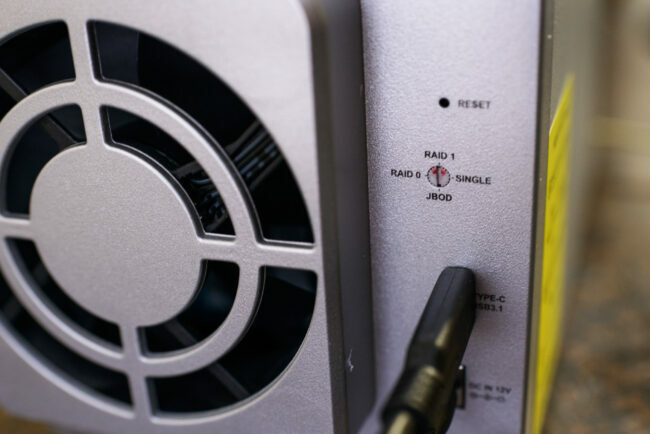 Much is written elsewhere for those who are learning how to configure a safe, reliable, fast RAID array (whether as an internal array, a DAS or a NAS) and you have nicely covered some of the facets. I thought a few readers might benefit from knowing a few additional nuances (and caveats) so I will expand upon a couple items you mentioned. As you correctly mention, RAID 0 is “made for speed” while RAID 1 is “for safety.” A bit more information might help those who aren’t familiar with what each can do for you (or do to you). 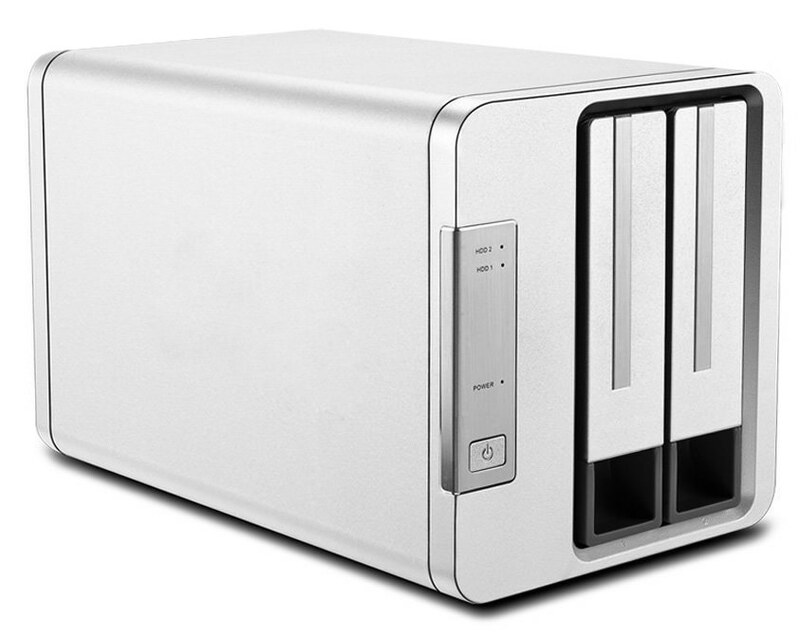 RAID 0 can take two HDDs and give access times that approach that of the interface itself (in the case of this enclosure, USB 3.1). That’s the good news. The bad news (as you’ve stated) is “if one hard drive fails, you lose all of your data in the whole array.” It’s tempting to ignore this caveat or pretend “it won’t happen to me”; yet one must understand that the metrics used to measure the probability of drive failure (such as MTBF [mean time between (or before) failure]) will, in the case of a two-drive RAID 0, be doubled. In other words, given that you have two drives — each with their own probability of failure — that mutually rely upon one another, the likelihood of a catastrophic failure is doubled. So a RAID 0 is clearly less reliable than a single drive, merely because of the likelihood of HDD failures. I’m not saying one shouldn’t use a RAID 0 (I’ve used such RAID arrays for years when needing to enhance system speed when using HDDs for large data sets); HOWEVER, it’s even more crucial that a user of non-mirrored RAID arrays (such as this DAS) MUST include a regular backup plan to some other medium/device/array AND must purchase high-quality, matched drives for the DAS. It’s an unmitigated disaster when a drive (including a RAID 0 array) fails without a backup. RAID 1 arrays, on the other hand, are twice as reliable as a single drive yet the array will operate at the same speed (or, as is often the case, ever-so-slightly slower speed) as each HDD itself. So RAID 1’s aren’t great for photo editing for the reasons you’ve stated. Also, it may also bear mentioning that many HDDs are not certified for usage in arrays; one should check the HDD in question (before buying) to ensure it’s RAID compliant. (Thus, I would be cautious about your statement that “…it allows you to use any low-cost, fast storage you can find, including existing hard drives for a PC build that you might have laying around in your house”. While this enclosure might allow it, it doesn’t mean you should do so.) Drives certified for “enterprise” usage are generally RAID-compliant; likewise (but not always) for SSDs. One must research this carefully to ensure you’re building a robust, functional RAID array. Lastly, it’s almost always best to purchase pairs of drives that are identical (same make/model/capacity) for usage in such an array. Thanks for all your great reviews and articles! Mark, thank you for adding all this useful information! As far as which drives to use, you’re right, I think “any” was the wrong word to say there. It certainly does open up the market for additional options, but not everything you find will work. And I fully agree about having a separate backup. Regardless of configuration, including RAID 1, this absolutely doesn’t function as the only place you should store your important work. The simple explanation is that this device holds two hard drives, although a slightly different type of hard drive than what you’d normally use externally for a laptop or desktop computer. The benefit of having it is that you can set up the two drives to, essentially, mirror one another instantaneously (in “RAID 1” mode) or even speed up the performance compared to either drive individually (“RAID 0”) mode. There are a huge number of enclosures you can find online that will do something similar, and this is more of an entry-level model because it only fits two total hard drives. But it’s still a good one, and it can be a useful way to speed up your workflow if your computer’s internal storage isn’t an option (i.e., you’ve run out of space) and you need to work off of external storage. This is a viable option to my present set-up of two NAS dual enclosures; one with a pair 1tb WD REDs for my portfolio and one with two 2tb WD REDs for general archiving of source files. The REDs run at about 5500 rpm and because they are in NAS enclousures, they do not spin all the time unless during a read/write. The upside is they are expected to have significantly longer lives. The downside is, they do not allow for RAID configuration and I am stuck with a clunky workflow of saving to the first drive and then manually backing-up to the 2nd drive. The obvious problem is not really being on-point all the time and making the backup happen as I should. I also have a set of Passport USB drives of the same sizes in a fireproof box on flat USB cables as a secondary back-up. This could solve a lot of my anxiety. Thanks. This is a viable option to my present set-up of two NAS dual enclosures; one with a pair 1tb WD REDs for my portfolio and one with two 2tb WD REDs for general archiving of source files. The REDs run at about 5500 rpm and because they are in NAS enclousures, they do not spin all the time unless during a read/write. The upside is they are expected to have significantly longer lives. The downside is, the boxes do not allow for RAID configuration and I am stuck with a clunky workflow of saving to the first drive and then manually backing-up to the 2nd drive. The obvious problem is not really being on-point all the time and making the backup happen as I should. I also have a set of Passport USB drives of the same sizes in a fireproof box on flat USB cables as a secondary back-up. Thanks for the review. I’m using a Raid 1 configuration with Windows software Raid in my homebuilt PC in hot swap cages. Do you know how something like this performs in comparison to intrnally mounted drives when comparing conventional drives? Is there a benefit to the hardware Raid or USB C? a) All other things equal, hardware-based RAID is almost certainly going to be faster than software-based RAID, so a Windows software RAID solution (which I believe is what you’ve written you have) would likely be no better than, and probably slower than, this TerraMaster device. b) Given that your PC is home-built, many motherboards do contain onboard hardware RAID support; one would need to dive into the owner’s manual for your motherboard to find out if it’s available, and if available then dive into the BIOS… and reconfigure the appropriate SATA ports on your motherboard. It’s not a daunting task for a tech, but it’s definitely not an “entry-level” task either. And be careful! One should NEVER reconfigure any RAID array without having FIRST done a complete backup and then tested the veracity of that backup. If in doubt, don’t do it! c) An external RAID device like this TerraMaster would have a dedicated hardware solution for the array; that would make its internal functionality very efficient (meaning fast), as would a hardware RAID if it should exist on your motherboard. For an external DAS device like this, the interface itself is often the slowest link, but USB 3.1 is probably faster than the RAID 1 array so in that case the speed of this external TerraMaster is possibly as fast as any internal hardware-based RAID 1 of HDDs (such as what you might be able to deploy inside your PC). But the huge advantage for the TerraMaster (or any DAS) is that it is DAS and can thus be moved between several computers. That makes the DAS a much more flexible solution, as Spencer has described. Will it do 4 slices?